Three teenagers have been jailed for life for murdering father-of-three Garry Newlove, who was kicked to death outside his Warrington home. 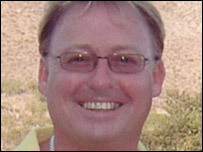 Mr Newlove, 47, was attacked when he confronted a gang of vandals in August 2007. He died two days later. 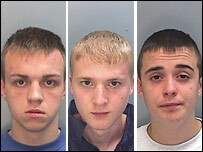 Adam Swellings, 19, Stephen Sorton, 17, and Jordan Cunliffe, 16, were convicted at Chester Crown Court last month. 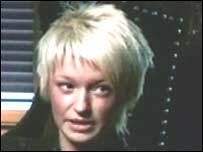 Swellings, of Meredith Street, Crewe, was sentenced by the court to serve a minimum 17 years in jail. Sorton, of Honister Street, Warrington, was ordered to serve a minimum 15 years and Cunliffe, formerly of Rowland Close, Warrington, must stay in jail for at least 12 years. Mr Newlove was kicked "like a football" by the youths, the court heard during the trial. It emerged, after the trio were found guilty on 16 January, that Swellings had been released from custody for an assault just hours before the attack on 10 August. He was freed on bail on condition he stayed away from Warrington but he remained in the town despite the court order. Jailing the teenagers, Mr Justice Andrew Smith said: "You were three of a gang who attacked Garry Newlove only because he had the courage to remonstrate with you. "For you all drunken aggression was part of the night's entertainment. "It was a gang attack, each of you continued to behave aggressively after you had finished with Garry Newlove." Recalling the night of the attack, Mr Newlove's 18-year-old daughter, Zoe, said: "They just acted as a pack - it was horrible. "I think if some of them hadn't drank as much, they would have stepped back and thought, hang on a minute, what are we doing. "But Swellings, he's just evil anyway. I reckon even without a drink he would have done something stupid like that anyway." Mr Newlove suffered massive head injuries in the attack which took place shortly after the gang had kicked the door of his wife's car, parked outside their home in Fearnhead. His widow, Helen, 44, spoke out after the guilty verdict and pledged to campaign to make Britain safer. Speaking at a news conference, she said: "I am determined to carry on for the sake of my wonderful husband Garry. He will not have died in vain." Outside court, Det Insp Geoff Elvey of Cheshire Police said he didn't believe any of the defendants had shown any remorse. "They will have time to reflect upon their actions," he said. He said he hoped other people would learn from this case, and realise the police and local communities would not tolerate such anti-social behaviour. "I would like to reiterate that it is the responsibility of all of us within the community to work together to reduce this type of behaviour by reporting incidents to the police and by exercising parental control over our children," Det Insp Elvey said.